School’s out, summer’s here, and there is nothing better than ice cream on a hot day! 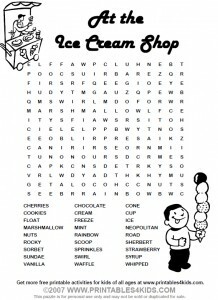 We have created a word search with all the great treats and flavors you will find at the ice cream store. Click on the image above to view and print full size or download At the Ice Cream Shop Word Search as a PDF file. For more ice cream fun, visit Ben and Jerry’s ice cream Fun Stuff page or sign up for the Baskin Robbins birthday club for free ice cream.